Thirsty, the Giant Parade Puppet. 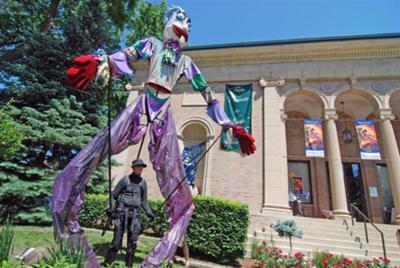 Giant Parade Puppets (up to 18 feet tall!) are ideal for parades, festivals, fund raisers, civic and corporate events. You have seen them on TV, now you can experience them at your event. Friendly Giant Parade Puppets shake hands with your guests, give group hugs, and even attempt to steal the hats of the unwary! Fabulous for art festivals, parades, traffic flagging, car lot promotions, holiday celebrations, even concerts! Giant Parade Puppets come in Mardi Gras, Cowboy, Chili Pepper and other designs. Travel Colorado and surrounding states. We have performed at the Cherry Creek Arts Festival, the Denver St Patrick's Day Parade, the Banner Bank Grand Opening in Boise, ID, and other events in AZ, NM, UT, NE, NV, OK, IA, and AR. Call today! Bill Coleman Entertainment. GiantPuppet.com DVD available. 303-922-4655.